Why Are Sea Turtles Important? Healthy oceans need sea turtles. Sea turtles are a "keystone species", which means they are an important part of their environment and influence other species around them. If a keystone species is removed from a habitat, the natural order can be disrupted, which impacts other wildlife and fauna in different ways. Coral reefs are home to hawksbills, which specialize in eating a handful of species of sea sponges. This diet allows less common types of sponges to grow, which increases the variety of life on the reef (also known as "biodiversity"). Without hawksbills, sponges can overgrow and suffocate slow-growing corals causing them to die. 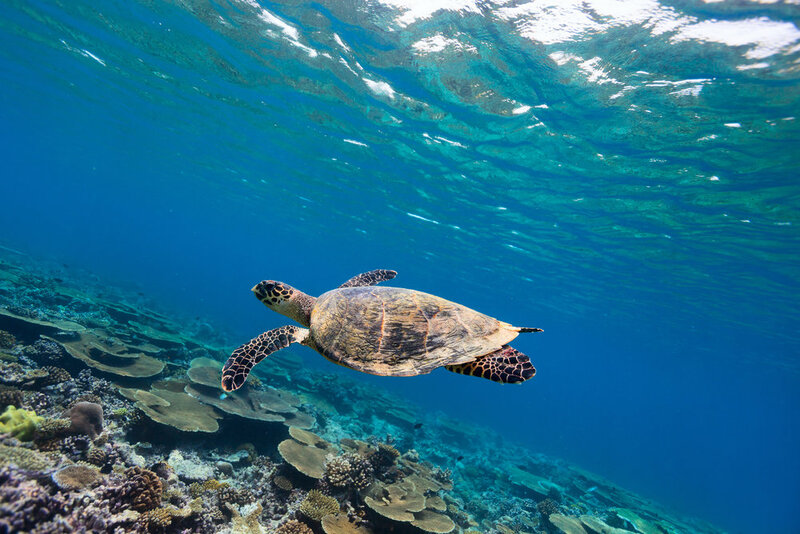 As reefs become more and more threatened by climate change and other impacts, the role of the hawksbill on the reef is even more vital. Learn how you can help protect hawksbills through our Too Rare To Wear campaign and sign our pledge to avoid turtleshell. Sea turtles also have a positive influence out of the water. Nesting sea turtles help beaches by depositing their eggs in the sand. Eggshells and unhatched eggs left behind provide important nutrients that nourish dune vegetation such as beach grasses, which stabilize dunes and help to prevent coastal erosion. Sea turtles are prey for other animals at all stages of life. Hatchlings are prey for birds, crabs, land mammals, and fish. Adult sea turtles are prey for apex predators like sharks and orcas. On some beaches in Costa Rica, adult female sea turtles are even prey for jaguars that prowl nesting beaches at night, making sea turtles an integral part of food webs on land AND in the ocean! Different species of sea turtles feed on different things, though most of them like jellyfish. Leatherback sea turtles specialize in eating jellyfish which keeps jellyfish populations in check. If leatherbacks were to disappear, jellyfish populations would explode. Jellyfish prey upon larval fish so without leatherbacks; without these larval fish there would be no fish in the sea! Again, it’s all about balance. Adult green sea turtles primarily eat sea grasses, acting as aquatic lawnmowers which help keep seagrass beds healthy (like mowing your lawn!). Seagrass beds which are found in shallow marine waters, provide habitat, food, and protected nursery areas for many fish species, enabling them to take shelter from predators until they are larger. Healthy seagrass beds also help to stabilize the ocean bottom which helps decrease erosion from wave action and storms. Sea turtles provide habitat for an array of “aquatic hitchhikers” like barnacles and other small crustaceans, remoras, algae, and diatoms. Because sea turtles undergo long migrations, they help to transport these species. They also act as sort of an umbrella for fish that use them as shelter from predators. When at the sea surface to breathe or rest, sea turtles also sometimes provide a resting spot for seabirds to land on - sort of like a reptilian aircraft carrier! Sea turtles play an important cultural role for many coastal communities around the world. Many indigenous cultures revere them or consider them ancestors. They are also an important source of income for coastal residents through turtle-watching ecotourism. Research has shown that sea turtle ecotourism can generate three times the income than by selling sea turtle parts (eggs, meat, & shells), making them worth more alive than dead. Aside from their important ecological role, sea turtles are some of the most charismatic animals on the planet! It seems that everyone loves sea turtles. They are a source of awe and inspiration; watching them haul themselves up a beach to nest, swim through a reef, or watching hatchlings charge to the sea are truly magical and unforgettable experiences. Without sea turtles our blue planet wouldn’t be complete. Sign up for ways to help save turtles, fun promotions, and discounts!